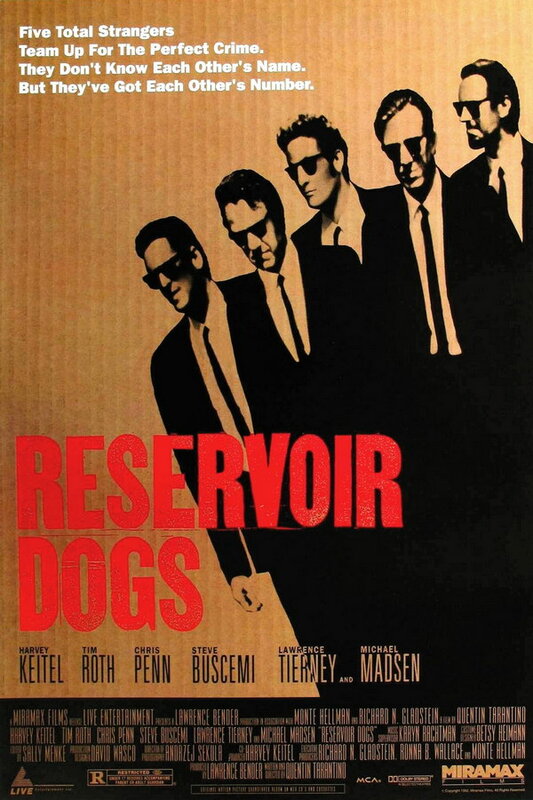 The first review in today’s celebration of Tarantino’s 50th birthday is the somewhat controversial review of Reservoir Dogs provided by my good friend Christian Robshaw. Many thanks to him for contributing this post! Please stop by his sites Writers in a Single Sentence and Mediocre Batman. They are both worth checking out! It’s astonishing, on re-watching it, just how brutally brilliant ‘Reservoir Dogs’ still is, given that it introduced a formula all its own, more or less – Tarantino’s movies may be assembled with pieces from other movies, but that was itself part of the point: he was the first postmodern director, and of course his commentaries on the rôle of pop culture took the form of repurposed quotations from pop culture. But the particular patchwork pattern he created was so influential that it no longer seems original, so accustomed are we to weak rip-offs of the style: fast-talking, pop-culture-obsessed male egos clashing to obscure pop gems and occasionally committing extreme violence is a genre all its own now, and the weakest of the Tarantino imitators is Quentin Tarantino. It should be easy, after ‘Django Unchained’, to become weary and dismissive of the early stuff: maybe the films were always dumb and adolescent, and they just seemed cleverer than they were. That’s not the case. I don’t know how it’s possible, but Tarantino has aged backwards. 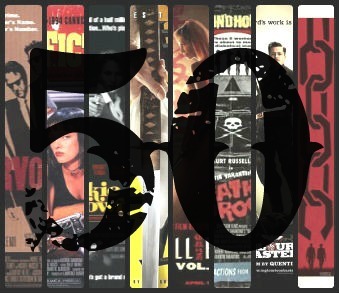 He should have started doing the tiresomely “awesome” genre stuff, first started to get creative on ‘Kill Bill Vol. 1’ and produced his masterpiece in ‘Pulp Fiction’. ‘Reservoir Dogs’ isn’t as good as ‘Pulp Fiction’, which is essentially the same film but longer, more expensive, deeper, more rewarding. ‘Reservoir Dogs’’ major fascination, though, is – and it’s the last thing you’d expect to hear Tarantino praised for – its moral grounding. The nihilistic violence of ‘Django’ and ‘Kill Bill’ gets old fast. ‘Reservoir Dogs’, by contrast, rarely features acts of violence, and when they occur, it is shocking; as casually as they may be treated by their perpetrators, the film itself – and the audience – understands the power of violence, and it is in part this dissonance which means the film is more than meaningless spectacle. It’s a little absurd that such a principle, so key to the works of Hitchcock or Scorcese – two of Tarantino’s big idols – should need explaining like this, but it is a principle the director later forgot. The violence in ‘Reservoir Dogs’ occurs as a logical end-result of what we know about characters and their circumstances. The central power struggle of the film – its enduring depth, once the admitted coolness of suits and swaggers and the George Baker Selection has worn off – is between Mr. Pink and Mr. White, and it does not so much make a particular moral argument as animate the struggle between two vivid, cohesively realised people who have genuine psychological and philosophical depth. So what is ‘Reservoir Dogs’ about? Nothing in particular. It’s about a heist gone wrong. But really, it’s an argument between the virtue ethics of Mr. White and the utilitarianism of Mr. Pink. Or again, it could be about the failure of Mr. White’s code – his “honour among thieves” – in the face of extreme circumstances. Or it could be about an old-fashioned concept of male friendship – the one seen between Mr. White and Mr. Orange – how it can apply today, what it can achieve and, crucially, what it cannot endure. Or it could be about trust, which, given the isolation of the mind, is essentially a crapshoot. Or perhaps Mr. Blonde is the key character, and the film is a study on how society deals with antisocial elements. None of these are supposed to be definitive readings of the film. The only point is that all of them are potential readings, and the mere fact that so many are possible in itself illuminates that this film is proper art. It’s very difficult to have much to say at all on how to read ‘Inglourious Basterds’ or ‘Django Unchained’, but it’s not actually that difficult to write films with a point – when you’re not regressing into adolescence, anyway. So – happy birthday Quentin, you’re getting younger every year. I recently saw this again and it was as great as I remembered it to be. Nice review, it’s my second favorite QT film (after Pulp Fiction of course). Any other order would be silly. Thanks for the opportunity, J. Thanks, Georgina! I didn’t mean to focus quite so much on critiquing Tarantino’s later stuff, but well, it worked out the way it worked out I guess. It must be one of the best directorial débuts ever, yeah. I’d take this over Pulp Fiction but by just a hair! Great review.